Here is a sample of what Coco's registration papers would have for pedigree information. When choosing a registered name, the owner/breeder has the choice of which names of sires and dams they would like to use. It is common to choose bits and pieces of the most commonly known names. For example, Coco's paternal grandmother, Genzana, was named partly after her sire genuine Doc, and partly after her mother, Zan Parr Jetta (Gen+Zana). 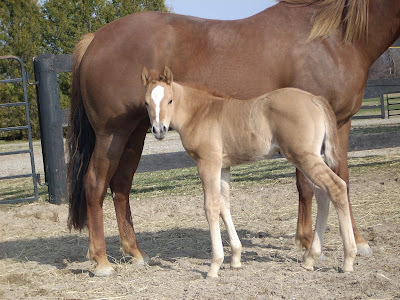 It is also common for the owner/breeder to name the horse after a specific characteristic that the foal may display within it's first few hours or days. For example, Hollywood Dun It would get "Hollywood' from his sire, and the "Dun" part from his colouring (he was a buckskin coloured dun). If you take a look at (Peanut) Smart Like Jac's sire, there is one name in brackets. The formal registration papers that a horse has for identification would be it's American Quarter Horse Association papers. If the horse was a Paint, it would be it's American Paint Horse Association papers. In this case, the horse is a quarter horse and registered under the name Sugar Bar Buckaroo. The horse was also shown with the National Reining Horse Association where a competition license is required. Most owners choose to have the same name on both papers but in this case, the horse was named Jac Be Quick for it's NRHA competition. Larger breeding operations often opt to include their intitials or brand in the name, (ie. HH Coconut Jac, HH could stand for Hayes Horsemanship and/or be the brand). The initials and brand serve as an advertisement wherever the horse is seen or wherever the name is announced. Sometimes a foal can be named something totally different than it's sire and dam, grandsires and granddams. Often times, popular celebrities, song lyrics or movies are incorporated into the names. Owners can get quite creative with their name choices and turn them into a play on words. When applying for a registration, the name choice must be 20 characters or less including spaces, and with no punctuation. The application paper has space for 6 name choices listed by priority from one to six. If none of the name choices are suitable, or if they are all in use, AQHA will name the foal. We are looking for name suggestions! Remember: 20 characters or less, preferably a name that is derived from one or more names on the pedigree chart or specific to Coco's colour and characteristics. So, make your suggestions, and we will check to verify whether or not they have been used already. We will have a vote to find the top six choices which will be sent out on the registration application. From there, we will have to wait anxiously for AQHA to send back the official papers and reveal the official name choice! *Names marked with, "not available," are names that have been taken already in the AQHA database. Tell us your name suggestions and we will post all of them on this page as well as on our facebook page. Thanks everyone for your name suggestions! We are down to two final names based on the suggestions we've had and the votes on those suggestions on the website (here), on our Facebook page, and in person during lessons this week. The two final barn name choices are: Butter Cup (as in Peanut Butter Cup) and Coconut ("Coco" for short). Please let us know your oted before the end of the day TODAY! We hope to have a name for the little one by the weekend! We will post the pedigree for those of you putting together suggestions for registered names. Please note that names will have to be checked against the AQHA registry. We will take the top six name suggestions. Thanks again! Sunday late morning, only hours after Peanut had given birth to her filly, Peppy gave birth to a colt! Have another suggestion or a suggestion for a registered name? Let us know! Born April 2nd at 1:30 am. Both baby and mare are doing wonderfully! Updates and more pictures to come! A little bit more milk dripping now...over the weekend would be ideal, Peanut.